Good Afternoon!! 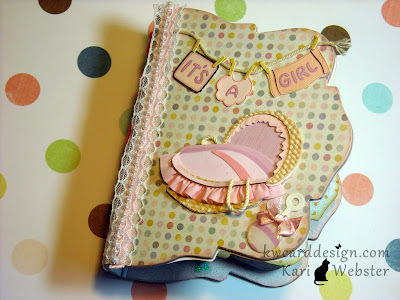 As promised, I am back to share with you my finished mini baby album I made as a request from one of my co workers. She is about to have another grand baby, a baby girl! 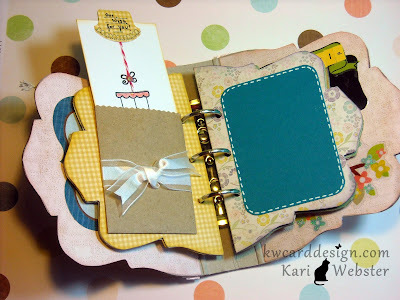 She wanted to give something different other than a card, but wanted something handmade. I am glad that she gave me plenty of time to finish this...about a month to be exact. The album I purchased is from Maya Road. If you watch me on YouTube, it was in one of my latest haul videos. 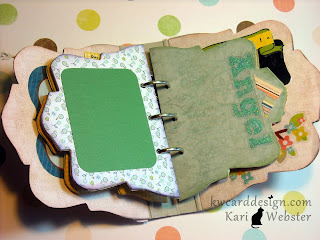 I used various products from various companies for this album, but the more prominent companies used was paper from My Minds Eye Miss Caroline collection, and embellies from Fancy Pants Baby Mine collection. A few things from Lawn Fawn were used, Stampin Up!, and Paper Smooches. This is the front of the album. The stickers for the front of this was actually purchased at Wal-Mart. You might recognize the set, because I made a baby card using these same stickers, and I knew immediately that I would use them again for this album. The front sticker is from the Baby Mine collection by Fancy Pants. Such a cute collection. 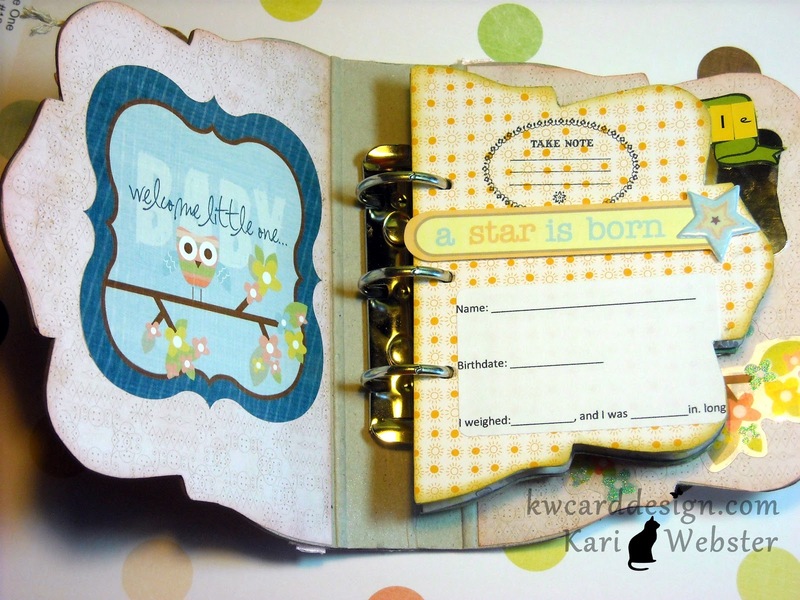 Inspires me to have a little one of my own :o) The first "page" is using papers from Lawn Fawn's Bright Side. I generated from my computer the basic info you might see in a baby album. 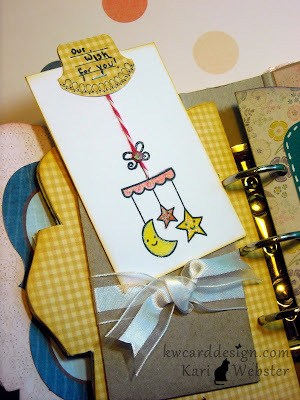 On the other side of the first "page" is a pocket that I had from a pack I purchased at Hobby Lobby. The person I made this for wanted to have a personal message for her new grand baby, so I thought this would be a cute touch. The ribbon is white organza ribbon from Stampin' Up!. I love this ribbon! The next side is a place where the parents can insert a picture of their new addition :o) I added some faux stitching for a finish touch. The other side of the second page is another place where they could insert a photo. The "angel" die cut piece also comes from the Fancy Pants collection. I figured they could put what ever else they wanted to here. On the left side of the page, I stamped, colored and cut out this image from Paper Smooches. This to me, is such an adorable image. So very sweet!! The dimensional sticker was just from a pack in my stash. And, finally the back of the album, we have a "reflective" page. 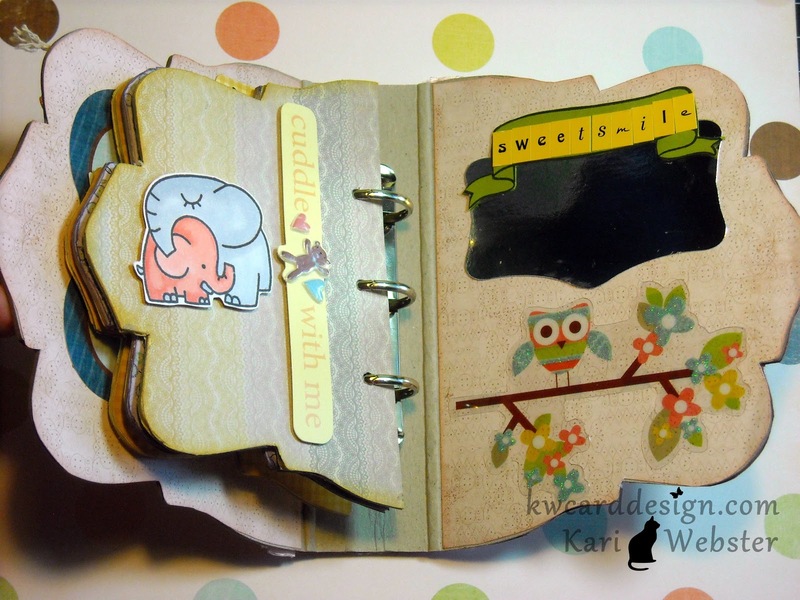 I thought it would be fun to have the baby see herself from this piece that is reflective in a way, that I die cut, and added a banner saying "sweet smile" The owl die cut piece, another from the Fancy Pants collection. 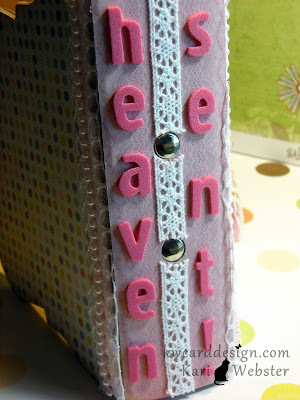 Last, but not least - the spine of the album - I used some foam pink Thickers, and spelled out, " Heaven Sent". I added some ribbon trim from Hero Arts to cover up my seam of the paper I cut to fit the binding. It was a fun challenge for sure. I sure hope that Sandy likes it!!! Any questions on anything I used, please feel free to leave a comment or email me, and I will be happy to respond!! Thanks for stoppin' in! !